Adjustable 9ct white gold spiga chain 20"
Adjustable chains have an innovative system which allows you to wear the same chain in different ways. 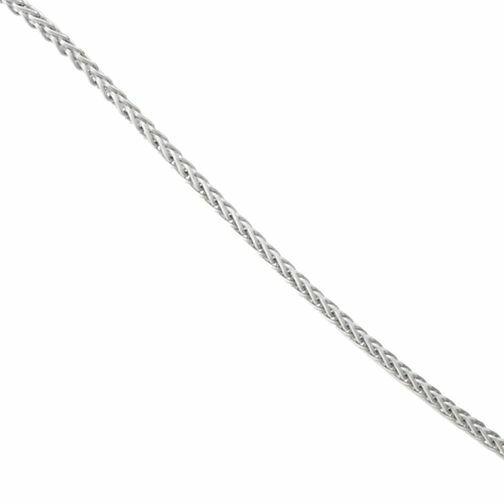 Simply grasp the sliding sphere with 2 fingers and move it up or down to achieve your desired length.Spiga chain expands to a maximum 20"
Adjustable 9ct white gold spiga chain 20" is rated 4.3 out of 5 by 6. Rated 1 out of 5 by Anonymous from Poor product quality ...chain broke within 4 days of purchase Bought this chain only 4 days ago for a diamond pendant. I was very lucky that I noticed this new chain had broken at home as I was able to find the diamond which had fallen off. The chain was not tugged or pulled in any way but is clearly not fit for purpose. Will be returning asap. Rated 5 out of 5 by Anonymous from Exactly as described I needed a white gold chain to complement an opal pendant. This item is a perfect match, the colour and length are exactly as described, so it’s ideal for purpose. I am very happy with my purchase.